GIANT-GXRH2424-111 - PUMP,HORIZ.,2.4 GPM @2400 PSI,REG. GIANT-GXV2525-112 - PUMP,VERT,2.5 GPM @ 2500 PSI,UNL. GIANT PUMPS - HR2020-111H - Triplex Ceramic Plunger Pump 1.8GPM@2000PSI@3450RPM. GIANT PUMPS - HR2020-211H - Triplex Ceramic Plunger Pump 2.0 GPM @ 2000 PSI, 1.8 MM INJECTOR. GIANT PUMPS - HR2527-111H - Triplex Ceramic Plunger Pump,2.5GPM@2700PSI,FIXED INJ,HA. GIANT PUMPS - HR2527-1A11H - Triplex Ceramic Plunger Pump,2.5GPM@2700PSI,ADJ HANDW. 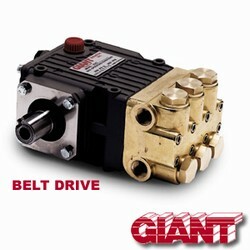 GIANT PUMPS - HR2527-211H - Triplex Ceramic Plunger Pump 2.5GPM @ 2750 PSI, 1.8MM INJECTOR. GIANT PUMPS - HR3025-111H - Triplex Ceramic Plunger Pump,3.0 GPM@2500 PSI, 3/4".